Unlike Contacts and Opportunities, you cannot create a Saved Search for Tasks in Infusionsoft. Instead, you can create a Saved Report for Tasks but unfortunately Saved Reports cannot be imported into turboDial for List Dialing. To solve this problem turboDial can include three special entries in the Saved Search selector of your turboDial panel. Those entries are: (My Tasks Due), (Filter My Tasks) and (All Tasks Due). When you choose one of those entries and click the Load button turboDial will search Infusionsoft to find the incomplete Tasks. If you choose (My Tasks Due) then turboDial will import the list of Contacts who have an incomplete Task owned by you. If you choose (Filter My Tasks) then turboDial will first prompt you to enter a search phrase and then import the list of Contacts who have an incomplete Task owned by you and a Title that includes that search phrase. If you choose (All Tasks Due) then turboDial will import the list of Contacts who have an incomplete Task owned by anyone. This option is not available if you have enabled the “Restrict views to owned records” setting in the Global Options. Each time you change the phrase you use to filter your Tasks you must be careful to not use any previously loaded Power Dial list that was loaded via (Filter My Tasks). You should use the RESET button to discard any currently loaded list, then when you LOAD the list a new list that represents Tasks matching your new search phrase will be loaded. Since these Task lists are not already configured in Infusionsoft turboDial must create them in real-time. Therefore the time needed to import the list will be much longer than the time needed to import a Saved Search. For this reason you may want to import the Task list using the “Power Dial” option. With Power Dial your list will be retained by turboDial so you can use it across sessions. For example, you can stop calling at the end of the day and resume the next morning with the same list, and thereby eliminate the time to import the Tasks list again. Also, Power Dial allows one list to be shared by multiple Users. So once the first User has loaded the Task list the next Users to load that same list will see a much faster load time since the list is now cached in the turboDial server. The interface screens in Infusionsoft will not display incomplete Tasks that have old action dates, for example older than 1 year, but you can find them via a Task-Note Report in the Admin section. turboDial will display those old Tasks when you are viewing a contact record. If you find that your list of Contacts for Task Dialing is clogged up with Contacts who have only old Tasks, you can use a Task-Note Report to find those old Tasks and delete them. 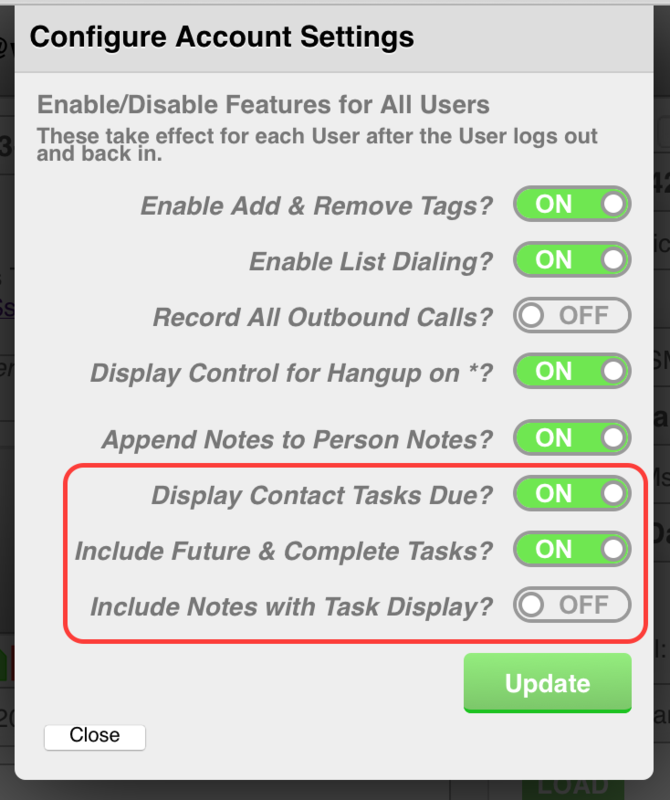 You may also see tasks displayed in turboDial that cannot be found by any method in Infusionsoft. This is due to a problem in the Infusionsoft API and cannot be avoided. You can simply complete a phantom task when you encounter it and it will not return. To enable this feature you must set the “Display Contact Tasks Due” option in the Global Options window to be “On”.